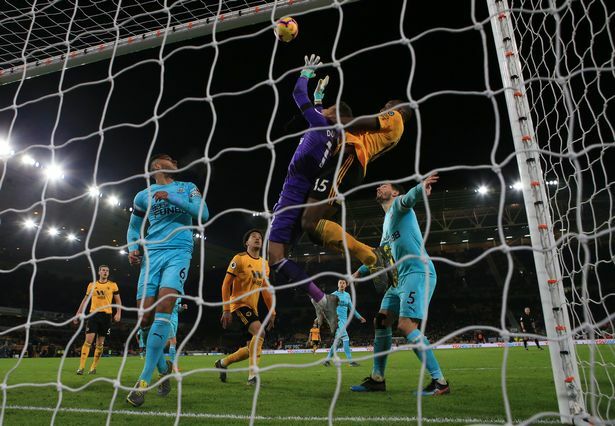 Jamie Carragher and Patrick Kluivert raked over a controversial end to the Newcastle United Monday Night Football game at Wolves . Here is a full transcript of what Carragher and Kluivert said about the Martin Dubravka incident, whether it was a foul, Rafa Benitez’s reaction, the relegation battle and the performance of United new boy Miguel Almiron. Jamie Carragher : No it wasn’t. You have to give great credit to Wolves. But the goalkeeper - and I think he’s been a great goalkeeper for Newcastle - he’s made a few mistakes of late . Willy Boly shows great desire to get there. He jumps earlier than the goalkeeper, his hands are resting on the goalkeeper but he has to do better. It is a contact sport. There can be contact. His hands go up to give him leverage and I don’t think it’s a foul. It looks worse when you really slow it down but I think the goalkeeper has to do more. If you run it at quick speed - it’s a little touch on him. And that isn’t the first time in the last few weeks he’s cost them. When Rafa signed Pepe Reina he signed him because he liked him punching. He didn’t like his goalkeepers trying to catch the ball and leaving themselves open to a striker coming in. If you look at it when it’s stopped you’d say it’s assault but it’s not. I understand what Patrick (Kluivert) is saying about the referee playing too much time. But what the officials say is it’s four minutes minimum. Take into account whether they’re adding on time during the injury time. You rarely see stoppage time ending at the end of the stoppage time. Carragher : I was surprised. It’s difficult for a manager to speak after the match but he’s basically said the goalkeeper’s made a mistake. There was probably enough in the challenge that Rafa could have come on and said ‘It was a foul’ and not everyone would have said you’re talking rubbish. 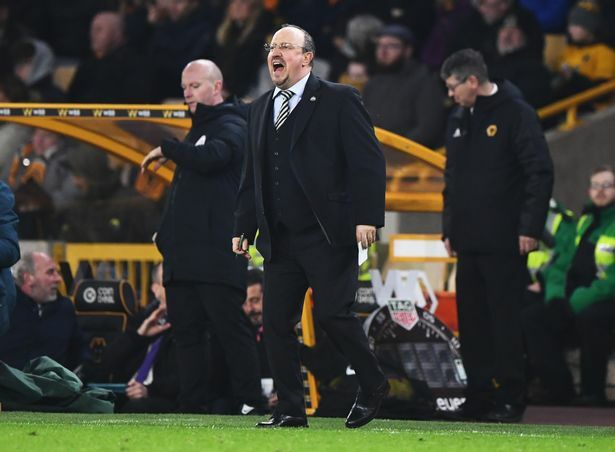 Fair play to Rafa Benitez for being so honest and maybe looking at his goalkeeper should have done better and no doubt, he should have done better. When he first went on the pitch he thought it was a foul and it was that frustration of losing it so late on. You can see him shouting foul but probably having looking at it again after looking with his analysts he’s probably concluded his goalkeeper should have done better and certainly not for the first time in the last few weeks. Kluivert: At the end of the game was so furious. He said it a little bit soft but I think he meant his goalkeeper should have done better. If you’ve got the mind that your goalkeeper should be punching the ball away you don’t even have to think about what’s around you. I think that his jumping ability was really lacking. He had in his mind he will catch the ball and you put doubt in the mind of the defence. Carragher : They seemed to have such a tough start the way the season started and we’re now in the second half of that start so they’re just getting through that now. On paper I think Rafa believed he would get the results against teams he would expect he’d pick up points against in the first half of the season and now he’s got to do it in the second half. That’s why those games become so important. Because if you don’t win those games it’s the teams around you in that mini-league and they’ve played less games against those teams down there than anyone. They’re going to make it up in the next couple of weeks but the big problem is that if you don’t win those games and lose some of them, the points go to your biggest rivals. Kluivert : He’s a lively boy. Very quick and I think he gave a good impression for the minutes he played. Carragher : I liked what I saw. His willingness and energy were good. It’s not easy to come on as a substitute when you’re winning the game. He looked lively, he looked sharp.